Notes: Looking for a unique gift for your April birthday gift giving? 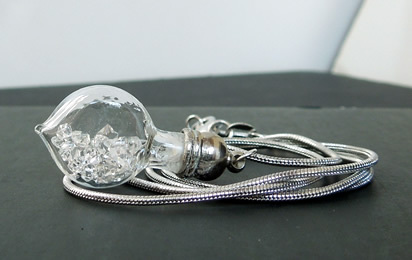 This glass genie bottle necklace is filled with over 30 perfect miniature Herkimer Diamonds. They measure from 2-4 mm and all are AA grade. The genie bottle measures 27x13 mm and is suspended from an 18" plated silver snake chain. It's a perfect alternative to traditional diamond birthstone jewelry. 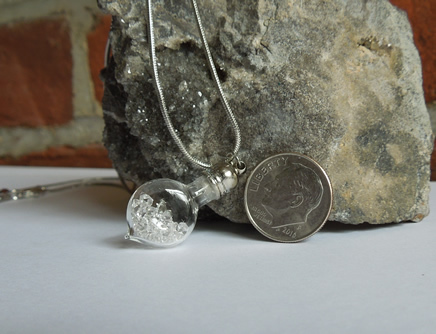 Herkimer Diamonds are an amazing accomplishment of Mother Nature. All Herkimer crystals, whether single or on matrix, purchased from HerkimerCrystalsOnline.com are guaranteed to be in their natural form. That is to say, none of the quartz crystals have been touched by machinery or polished in any way. What you purchase is exactly how it came to us from the Earth.